*special note: the black-and-white photos duplicated here were taken by Lena Herzog, and you can see more of them HERE. As part of a collective essay [with Jeffrey, Karl, and Mary Kate] for an issue of Literature Compass on "E-Medieval: Teaching, Research, and the Net," co-edited by Orietta da Rold and Elaine Treharne, for which Karl, Jeffrey, and Mary Kate have already shared drafts of their sections -- "Two Proposals for Increasing Permanence, Exposure, and Humiliation," "The Darker Side of Blogging", and "Thinking Aloud: Process, Product, and Becoming an Academic," respectively -- I offer here a draft-in-progress for my own ruminations [which echo, to a certain extent, Mary Kate's piece] upon blogging as a valuable tool for experimenting with processural forms of scholarship -- forms, moreover, that better highlight the fact that there has never been such a thing as a solitary or "individual" work of scholarship, nor a solitary scholar, although our work as scholars has often felt, and often been represented, as such. Before leaping into this, let me also say that that is precisely what I am also doing here: leaping. When we share drafts of work here [work that is often headed to so-called publication in more conventional forms: the edited essay volume, the dictionary or encyclopedia, the monograph, the journal article, etc. ], as opposed to writing posts on any number of academic topics not intended for publication beyond the blog, we may have worked on those drafts in the quiet of our studies, maybe also presented them in other forums [such as conferences], shared them with others individually for feedback, etc., and then opened them up here to further comments and suggestions for revision. In this particular case, and as an experiment [for me], I am composing this draft directly on the Blogger post template and although I will, of course, edit what I have written for grammar, form, and sense before I hit the "publish post" button, this is in all senses of the term, a true "first draft," written around 2:00 pm CST on Tuesday, Sep. 6th, while listening to Thievery Corporation, drinking my second press of coffee, with my 4 cats and 2 dogs lying on various pieces of furniture around me on a beautifully sunny and cool day in Cincinnati, this week's issue of The New Yorker [5 Sep. 2011] lying open next to my laptop [and you'll see why below]. By my best estimate of my typical drafting process, I imagine this post will be done within 4 or so hours, at which point I will pour myself a glass of wine and move on to finishing another writing chore begun a few weeks ago [an interview on the post/human with Kris Coffield of Fractured Politics], but set aside continuously as I attended to copy-editing the next issue of postmedieval on New Critical Modes and also prepping a senior-level Chaucer class I have not taught since 2003 [! ], not to mention a gadjillion other small chores [drafting a tenure letter, working on a grant application, working on 3 essays promised by, um, before now, getting Kalamazoo 2012 paperwork in order, preparing for Speculative Medievalisms in NYC next week, etc.]. Comments are most enthusiastically requested, especially as this really is so first-drafty that by the time I get to the end, I'm sure I'll feel hopelessly mired in more way than one! *UPDATE on Wednesday, Sep. 7th: my drafting stalled about midway through what you will read below around 5:00 p.m. yesterday, so I moved on to other things, mainly frivolous, and returned to the draft today around noon, finishing around 8:30 p.m. The fact of the matter is, in order to guard against this "madness," we imagine all sorts of background-foreground distinctions all of the time: we need them, and they are necessary, even consoling, fictions. A life has to be livable, after all. I feel the same way about love: I know I'm making this up as I go along with a lot of props from others in history who have also been making things up as they go along. The trick is not to stop believing in individual lives, or in love, or even persons, but rather, to generously expand our conceptions of what counts as a life, what counts as loveable, what counts as a person. The ultimate aim is to work toward increasing, as much as is in our power, the general well-being of as many inhabitants [animate, inanimate, whathaveyou] of this world as possible. Or as Pablo Neruda once put it, much more eloquently than I ever could, "I don't know who you are. I love you. I don't give away thorns, and I don't sell them" [Love Sonnet LXXVIII]. Take the Dutch artist Theo Jansen who makes, or engineers, kinetic sculptures called "strandbeesten": the term "beest" is important here because, for Jansen, these are living creatures or "animals." 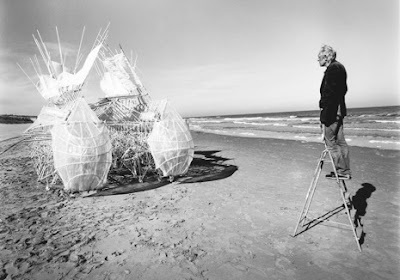 Jansen is the subject of an article in this week's New Yorker, "The March of the Strandbeests" [5 Sep. 2011: 54-61], and for over 21 years now, Jansen, 63 years old, has devoted himself to making these "beests," primarily out of PVC tubing and other materials, such as recycled plastic bottles and nylon zip strips. 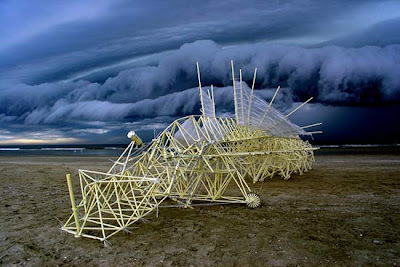 The beests are wind-powered, enabling them to walk, for example, along the beach [go HERE for videos of Jansen's sculptures in motion; I find myself watching these videos over and over again, they are so beautiful and mesmerizing]. 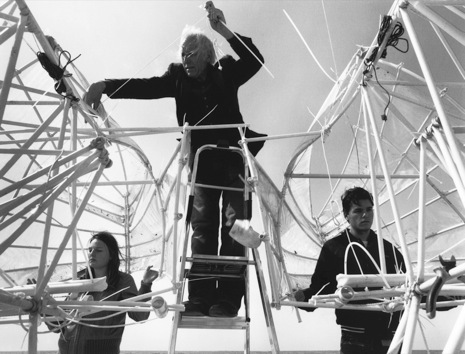 According to the author of the New Yorker piece, Ian Frazier, Jansen is "secretly a landscape artist" and his strandbeests are just "decoys to get us to notice the dunes, sea, and sky" [p. 61], and it's true that when Jansen first started making these "machines" -- "skeletons," as Jansen puts it, that are "able to walk on the wind" -- that he engineered them to push the sand around and thereby help bolster the threatened, eroding dunes of the Holland coastline. But this description of Jansen's "creatures" also belies so much of what Jansen himself says about his work that is not included in the New Yorker article -- that as it progressed, he realized he was making a "new kind of life" [some might call it "passive robotics"] and that his work also represented "research into the roots of life." Of his first prototypes, now decrepit and stowed away in a barn, he refers to them as being in their "catacombs," and he has also invented creative titles for the "eras" of evolutionary development his beests have gone through: the Gluton Period (1990-91) for the earliest period when his beests were held together with tape, the Chorda Epoch (1991-93), and so on. Of his ongoing work in making the creatures, he says, "they give me . 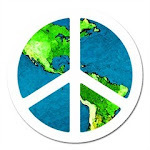 . . a place in the world and a way of living, and I give them life, so we both need each other. In fact, I couldn't live without them anymore. I think that's what you call symbiosis." Jansen also hopes that the beesten will outlive him: "What I'm doing now is training these animals to survive on their own. . . . It's a thought which makes me quiet -- when I die, I will be living for some time on. Of course this is a utopian thought. It's a fairy tale, something to look forward to, [but] with a lot of roots in reality as well, because some things, um, succeed" [quoted in the documentary Strandbeesten, dir. Alexander Schlichter, 2008]. Why dwell here on Jansen and his strandbeesten? Other than to point to him and his work as having gorgeously expanded the store of the world's beautiful "creatures," and even having rescued the lowly-yet-ubiquitous PVC pipe from its status as a supposedly inanimate object and transformed it into a protein-like building block of new life forms [note to Jane Bennett: "thing-power" never had it so good!]? While trying to think my way through how I might compose this piece on the value of open and collective forms of scholarship, enabled especially by blogging and social media such as Facebook and Google+, Theo Jansen and his creatures were much on my mind, and for very divergent reasons, all of which I think are worth describing here. First, Jansen is a great example of what we think of as a kind of solitary genius, even an heroic artist, who clearly likes to work alone [his website indicates he is not interested in taking on any interns] and who has dedicated over a third of his life to creating what he appears to believe [with some hedging] is a sort of new "species," but he doesn't really work alone, actually. He works with very particular materials -- materials, moreover, that Jansen explains "dictate to me what to do" and "[m]aybe that is why the Strandbeests appear to be alive, and charm us. The Strandbeests themselves have let me make them" [Frazier, "The March of the Strandbeests," p. 58]. Whether engineer-sculptors working with PVC pipes or medievalists working with manuscripts and other artifacts from the past, as well as with texts and language, and even when we are supposedly alone in our studies, we are always connected to and even acted upon by intricately-networked assemblages of actors and actants, persons [virtually enclosed in texts, but also our supervisors, mentors, peers, colleague friends, imaginary interlocutors, etc. ], objects, locations and even atmospheres, and our agency as "authors" is much more distributed [and even passive] than we might like to believe. Control is an illusion, as is objectivity, or even clear-sightedness. And creativity may even depend on this state of affairs, since it may be that the world brings ideas to us more so than that we bring ideas to the world. In this sense, scholarship would partly be about preparing ourselves, not to generate ideas, but to receive them. This is just to say that if we think keeping our scholarly work primarily out of public sight [except for the occasional conference presentation] until its penultimate moment of publication in a conventional venue such as the academic journal or book, at which point quite a few years of our lives [mainly spent in the solitude of studies and libraries or other semi-private spaces where we could manage a foothold] may have been devoted to that work whose "arrival" in print may even occur long after we have moved on to other projects, then we risk working too much in the dark, apart from the world which has bequeathed to us our objects and methods of study and reflection [I might also add here that this traditional way of doing things also keeps our work sequestered within the academy, and does not allow us to reach a more broadly public audience, which, in my mind, is a real perversion of the term "humanities"]. We also do our work largely apart from the very peers whom we hope will welcome and even love it when it is "finished." Yes, for the kind of work we do, quiet is required, even long stretches of solitude [because this is when ideas often arrive to us that could never have arrived any other way and also because it's hard to translate medieval Latin when people are milling all around you], but you've got to get outside every now then. And maybe also reflect on the fact that even the supposed inside/outside divide is primarily an illusion. Take Jansen [again], for example. He claims he likes to work alone, but he works primarily outside--his "workshop" is on a hill in the suburb of Ypenburg, near Delft, and he conducts most of his tests on the beach where strangers and friends, some of whom jump in as assistants, can watch Jansen experiment with his creatures. Jansen also allowed a documentary filmmaker, Alexander Schlichter, to follow him around, filming him at his work, for over ten years [you can see the film itself HERE]. 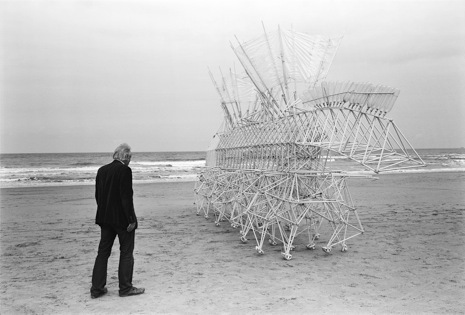 In addition, Jansen maintains a website [www.strandbeest.com] detailing the history of his work and engineering schemes and also including a live webcam that allows you to watch him in his "studio." Although a highly idiosyncratic character, and by his own definition, an obsessive, his work is completely open in the sense that all of its phases, even including the missteps and mistakes he makes along the way, is shared with the public: those close at home and also those far away, the accidental passer-by as well as the friend, family member, journalist, filmmaker, and those he has never met nor knows anything about [like me]. In a very real sense, a sort of community has developed around Jansen's work and in various, small ways, likely impinges upon that work while also broadening its scope of impact. What, in the final analysis, might be the ultimate value of Jansen's work, I ask myself: that he succeeds in releasing what he calls "herds" of beests upon the Dutch coastline who will outlive him [and us], or that he has bequeathed to us the visible products of a certain stretch of "working time" -- 21 years as of this writing -- in which he has labored, in the open [both in the sense of working outside but also by sharing his work-in-progress online], on his creatures? For me, the ultimate value is something enabled through both of these things: neither just the creatures themselves [product] nor only the windows upon Jansen's labors over time [process], but rather, an entrance through both of these things entangled with each other to a more ecological vision of the world and our work in it, one in which, well, frankly, everything matters, every last little thing, even the mistakes and the trash [indeed, Jensen speaks as lovingly of the individual PVC tubes as he does about the creatures that emerge from them]. 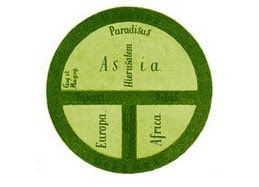 World and work are not separate, just as our articles and books could never really be separated from all of the forces [persons, objects, writings, places, etc.] that give rise to them, yet one of the most enduring images of the scholar is the Nietzschean overman who emerges from the solitude of his study with the monograph triumphantly held aloft in one hand, as if it had just sprung from his forehead. And there are rewards for that, of course. It's just that . . . it's such a terrible lie, not to mention a waste of missed opportunities for a more capacious intellectual fraternity. Which isn't to say our work is not unique, or not individual. Like Jansen, we, too, must be a bit singularly and even peculiarly obsessive or we likely wouldn't do the sort of work we do. Just to be a writer and a humanities scholar, in my mind, requires some obsession, which literally means to lay siege to a place: what I'm saying is, we often go "all out," and beyond the point of necessity; we dig deep holes. After all, the actual compensation for being a scholar in the humanities today is not even remotely equivalent to the compensation offered a doctor, a scientist, a banker, a lawyer, and so on, so we work on our scholarship, I would argue, primarily because we desire to do so and because we wish for some sort of permanence in this place we call the humanities, and the university. Yes, we have some carrots, like securing a tenure-track job and then gaining tenure and promotion, and the longer-term benefits that come with that, but much of our production as scholars is often way above and beyond what is required for those professional benchmarks and compensations. Plus, unlike a heart surgeon, who has to direct her attention and labor primarily to, um, heart surgery, we have more freedom in choosing the objects and methods of our labors: in other words, our work is deeply personal and even idiosyncratic in direct relation to our individual quirks and desires [which is not to say there are not quirky and highly idiosyncratic heart surgeons--someone had to invent the electric heart, for example--it's just that, in the humanities, choosing one's particular and supposedly heretofore uncharted niche is almost an obligation]. In this way, we really are all alone, or rather, we're singular, even while we remain attached to so much else. I suppose this is all a somewhat digressive way of making a plea, as my title indicates, for more open forms of scholarship, in which we retain the practical and liveable notion [if even largely fictive] that there is such a thing as an individual and individual work [which might, on certain dull and frustrating days, sustain us with the idea that we have something unique to contribute to larger, important conversations], but also recognize, and maybe perform better, the ways in which our work is always enmeshed with others [human, inhuman, etc.] who enable, in some degree, our every thought. Blogging has become, in my mind, an excellent venue for doing just that and for making more visible the ways in which we always think, not in opposition to, but with and for each other. It has been said more than once, and in various places, that while writing on academic blogs may serve the purpose of airing certain nascent and half-baked ideas and having more casual conversations about our profession and work [and occasionally about the ways in which our professional and personal lives impinge upon each other], that it is not, nevertheless, the place to do "real" or "serious" scholarship, which is supposedly better reserved for venues that incorporate "strong" forms of anonymous critique and peer review and the oversight of more formal interlocutors, such as dissertation supervisors, experts within your more narrowly circumscribed ambit of research, departmental colleagues, and so on and so forth. But all scholarship, whether articulated as a a still barely digested idea on a blog or presented in tentative digest form at a conference or represented as a more fully fleshed-out argument in a scholarly journal, is real scholarship--if, by scholarship, we mean the continual practice of the craft of intellectual research, reflection and writing in the company of like-minded artisans, in order to communicate our work to both specialist and non-specialist audiences, and with the hope that a life devoted to reading, reflection, and writing might have some effect on what I call, the way things turn out. At the very least, if nothing ever changes because of a scholar's work, something of beauty has been added to the world, some jewel-like artifact of a mind seeking a path through the thicket of books and history, a remainder for a future archive. But because I also don't ever personally bank on the future [or that dreaded thing some call "posterity," and in which print culture is, to a certain extent, heavily invested], I think that academic blogs have played a critical function in creating scholarly communities that would not otherwise exist in a profession in which, traditionally, travel to conferences has afforded the only real opportunities for sharing work with like-minded scholars in one's field. And how many conferences can most of us go to in a year? Typically, one or two. It can feel excruciatingly lonely working on one's dissertation or one's first article or one's first book and the advice that is sometimes received, to show the work more publicly only when it is beyond reproach, in my mind, creates a climate of anxiety and dread that is unnecessary. It also seems to fly in the face of one of the purposes of a university: to air and discuss and debate ideas in a free, open-air agora, unencumbered by capitalist and other special or proprietary interests, where experimentation, even when it leads to failure, should be encouraged and prized. I'm not saying this is reality; I'm saying this is the ideal we should try not to lose sight of. I am also trying to say: we need to learn better how to live in the scholarly NOW, and blogs have certainly increased the opportunities for doing that. It takes some extra work, of course, to spend part of each day reading and commenting on blogs and maybe also contributing substantive posts to a weblog now and again, but the payoff is that the small burst of conversation that might occur in the last thirty minutes of a conference session has now been extended beyond the conference itself, maybe even for months on end. With traditional academic publishing, one might wait years, from the conception of a work to its completion and then publication in a traditional print venue, before one "hears" or "sees" any kind of reaction to one's work, and there might be no reaction at all, at least, not one that is palpably articulated, whether in a review or an email. Every field has its superstars, of course, whose impact is fairly measurable and whose work visibly shakes up the contours of a field, but if everyone measured their success by this standard, we'd have one hell of a disgruntled professoriate [and let's face it, even the so-called superstars did not necessarily sit down one day and say to themselves, "I am aiming for stardom!" -- more likely, like all of us, they wanted to do smart, original work]. Cultural Studies of the Modern Middle Ages, edited by me, Myra Seaman, Kimberly Bell, and Mary Ramsey, and published by Palgrave Macmillan in 2007, received zero reviews. Zero. In the four years since it was published in 2007, I have never once received one comment from anyone in the field, either by email or in person, regarding whether or not the book had any sort of impact. I've seen citations of it in a few books here and there. The fact of the matter is, I know people have read the book and likely been affected by it, in any number of ways, and I don't and never have dwelled on its "reception," but my larger point is: in our profession, you could sit around forever waiting to hear what the impact of your article or book might be, or you could engage in a different sort of professional life altogether: one where the process of thinking and writing alongside others in the "open" -- Outside, where anyone might wander by and offer a provocation or new path to further thought, and where you can also count on your closest colleagues and peers to drop in and lend a hand -- might lead to a thickening of the possibilities of our intellectual affiliations as well as to our general well-being. I guess what I'm also saying here is that there may be more value in thinking and "working through" our scholarship online, in an environment that promotes and invites democratic, catholic, and convivial support, as well as the accidental tourist and silent voyuer, than there is in the traditional "finished product": the article, the book, whathaveyou, that may land with a thud and nothing else [nothing that can be visibly measured, anyway, which is why teachers and scholars often content themselves with the adage that their real success always lies in a future out of their reach]. At the very least, blogs provide a space for the sustenance of those of us who spend many hours alone in our studies and who may wish for a greater "company" during these times--"company," moreover, that also often serves as an important aid in the critical review of our work. And for what it's worth, academic blogs also often provide voluble appreciation of "finished products" that otherwise would go unnoticed, since the communities invested in blogs are typically invested as well in assessing and celebrating their affiliates' individual "products," whatever they might be. I would also add here that academic blogs aid in the quicker, more open dissemination of ideas to a broader range of people and also allow everyone a rare glimpse of intellectuals "at work," which means that blogs serve an important mentorship function in the field as well, while also demystifying scholarly study. We can only get so close to each other [there is always mediation], but what plying our scholarship more publicly on blogs can do for us, at the very least, is to get us deeper into the relations --scholarly and otherwise -- that always already inhere between us and our work, and between each other [even when those relations might not be so comfortable]. It can help us to see better that when we say we belong to a "field" -- like medieval studies -- that we share that field with others who work, not necessarily behind closed doors, but out in the open alongside us. In this scenario, intellectual property is communal, and I can't tell where your ideas end and mine begin. To paraphrase Jansen, that's what I call a beautiful symbiosis. The one thing that worries me, as an attempting academic (PhD in hand, and now seeking employment on something slightly longer than a 4 month basis), is the threat of people stealing your ideas. I don't even know if this actually happens on a regular basis, or if it is some Hallowe'en story sent to scare us. If one is more open about one's topic, if one blogs about this point which Malmesbury makes, what is the danger that someone else will take that idea and publish it before you do? The video of Jansen's work at the end of this post made my day. At first the spine of the "beest" ripples beautifully but the creature seems strangely immobile, despite the frenzied circling of the camera (on a truck?). Then Jansen pulls the switch and -- the camera now rooted in place -- the thing moves. It's stunning, and the dance the film creates between points of view nicely actualizes what your essay is about, Eileen. Certain works of solitude achieve something that more gregarious ones perhaps do not, because they aspire to the stillness of acclaim rather than the kineticism of conversation (which requires stuttering, awkward silences, and mistakes). The perfect books, the ones crafted after years of lonely research and careful checking and rechecking of their facts and translations and claims: these books are launched into the world to be admired, but they resist negotiation and interchange. They don't move. That is what some scholars want, and achieve; I don't think such an academic would blog. Thus your sorrow that Cultural Studies of the Modern Middle Ages -- conceptualized as a spur to dialogue rather than an endpoint or "product" -- hasn't had the reviews and hasn't triggered the public exchanges that you aimed for. You didn't want the book to be applauded so much as to be part of an ongoing conversation. At least, that's what I hope for with my books. The best thing that can happen to them is that once they are released like strandbeesten they roam to places I didn't expect them to go. Eventually, I hope, they wind up as fossils (that is, as surpassed but absorbed into something else, something with vectors of its own). A book's life is this movement. @zcat_abroad Thanks for your comments here, and let me see if I can speak to your fear of scholars stealing each other's ideas. It's not that this never happens [I know a few stories], but in every case where I know it has happened, it never actually derailed anyone's career nor hindered someone from getting a job, and aside from the VERY FEW [practically NONE] cases where scholars have gotten away with this, I would argue that you actually can't steal someone else's ideas [in other words, most cases of intellectual property hijacking are botched in some serious way]: our ideas are simply too UNIQUE to be able to be stolen without "collateral damage" to the thief. This is something I really believe: your ideas and approaches to Malmesbury are likely un-stealable; also, imagine the lack of scruples and non-conscience necessary to steal someone else's idea: it's a lot of work and the number of people willing to live with themselves to do such a thing can be counted, I really believe, on one hand. I realize that, in medieval studies, there are certain "finds" that happen occasionally [a text no one has yet discovered, for example, that might shed new light on the tradition of French romance, a new burial mound that radically changes what we think we know about Anglo-Saxon England, etc.] that scholars guard with a certain amount of secrecy, but for how long? Eventually, the text has to be edited and published, the contents of the burial mound brushed off and tagged and exhibited, and then it's all fair game for everyone, interpretation-wise, and it needs to be, because we need to recognize better that we hold these scholarly objects *in common* together. 2. don't share/air your work until you're absolutely certain your argument is 100% air-tight or you'll be humiliated and no one will take you seriously. These are such self- and I would also say "larger profession"-damaging precepts to live by. We need to think better of our colleagues than this and also work harder to institute safer mentoring relationships, where students, or recent PhDs, are encouraged to enter into communal discourse over their work-in-progress [with fellow students but also with early career and established scholars in the field], so that we can also work to horizontalize the field: you never know where the next nest idea will come from--possibly from anywhere, and I'm not sure hierarchies ever really accomplish anything beneficial, field development-wise. We're all learning all of the time and sure, some people have extra wisdom to offer, but sometimes that "wisdom" comes from the younger and not the more senior people in the field; other times, the best advice *does* come from those with more experience; the bottom line is: openness and a collective will to see everyone's professional well-being enhanced are the career modes we should be developing here. 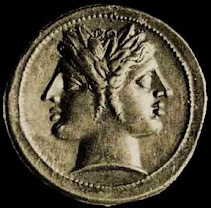 For myself, I try to put my money where my mouth is, which is why I blog, why I/we founded BABEL, why I/we founded postmedieval, punctum books, etc. I try not to just TALK about a more welcoming, radically democratic, and open field: I try to build platforms where this kind of field can be developed while also lending to those who are most vulnerable an imprimatur of professional legitimacy, and also, new fields of "play." I hope this makes some sense. 1.Plagiarism/stealing -- like you, I know of several cases, but unlike you, I also know of some which have resulted in recognition, etc.for the thief rather than the true author -- some cases very sad indeed. 2. Nonetheless, I feel the strenght of your argument -- for years I refused to even contemplate joint work, znd tgen when I finally did some, found it so rewarding that for the last 10-12 years of my pre-retirement, I hardlly did anything else. There are still thigns I would do alone ( some so as not to risk afriend gettibg stuck with bad reactions to my own slightly screwy approach to some scholarly problems) but I recommend that everybody try collaborating to find oyt how rewarding it can be. @ndh: thanks so much for your kind comments here. Yes, as you indicate, I'm sue that every now and then someone really does steal someone else's idea, gets away with it, and even gets praised for it [perhaps even advances their career as a result]. I know of one case where someone's dissertation was stolen in this way, and successfully, but I guess another thing I would say, that I didn't say in my reply to zcat_abroad, is that even when something like this happens, and the thief "gets away with it," that we still have to work against the climate that would make us fearful about sharing our work. You seem to already know that: bravo. Absolutely stirring and inspiringly utopian -- thank you for this. I love this post, and it also sparks a question for me. I'd be intrigued to hear what folks would say about how teaching might fit into this set of goals -- since teaching, interpreted one way, might also fit the model of constantly developing, shared, collaborative, tentative, and public scholarship. How much are blogging and teaching similar endeavors? I have also thought that putting ideas out there on the net shows that you are currently working on these things, which should protect against 'stealing' of ideas. Which is a good reason to blog under your own name, I guess. Perhaps it's easier to protect your own work, while discussing it with others, in the digital age. with so many academics living in the past (as in the glow of the 70's)it is so refreshing to see someone not just coming to terms with the realities of today but actively fashioning new ways of reaching out (literally extending minds) to make a difference in our lives together. thanks for the shot of hope. Thanks, again, for everyone's comments here and for the kind words. As to the similarities between blogging and teaching, BLB, I hadn't really thought of that until you raised the question. I think blogging IS, actually, an extension of teaching, in many many ways. I want to think further about this.